This article is about a type of boat or ship. For the pharmacy benefit management company, see Catamaran Corporation. Powered catamaran passenger ferry at Salem, Massachusetts, United States. A catamaran (/ˌkætəməˈræn/) (informally, a "cat") is a multi-hulled watercraft featuring two parallel hulls of equal size. It is a geometry-stabilized craft, deriving its stability from its wide beam, rather than from a ballasted keel as with a monohull sailboat. Catamaran is from a Tamil word, kattumaram, which means "logs tied together". Catamarans from Oceania and Maritime Southeast Asia became the inspiration for modern catamarans. Catamaran-type vessels was one of the earliest technological innovations of the Austronesian peoples. Early researchers like Heine-Geldern (1932) and Hornell (1943) once believed that catamarans evolved from outrigger canoes, but modern authors specializing in Austronesian cultures like Doran (1981) and Mahdi (1988) now believe it to be the opposite. Two canoes bound together developed directly from minimal raft technologies of two logs tied together. Over time, the double-hulled canoe form developed into the asymmetric double canoe, where one hull is smaller than the other. Eventually the smaller hull became the prototype outrigger, giving way to the single outrigger canoe, then to the reversible single outrigger canoe. Finally, the single outrigger types developed into the double outrigger canoe (or trimarans). This would also explain why older Austronesian populations in Island Southeast Asia, Madagascar, and the Comoros tend to favor double outrigger canoes, as it keeps the boats stable when tacking. But they still have small regions where catamarans and single-outrigger canoes are still used. In contrast, more distant outlying descendant populations in Micronesia and Polynesia retained the double-hull and the single outrigger canoe types, but the technology for double outriggers never reached them (although it exists in western Melanesia). To deal with the problem of the instability of the boat when the outrigger faces leeward when tacking, they instead developed the shunting technique in sailing, in conjunction with reversible single-outriggers. Despite their being the more "primitive form" of outrigger canoes, they were nonetheless effective, allowing seafaring Polynesians to voyage to distant Pacific islands. On the coast of Malabar they call them Catamarans. These are but one Log, or two, sometimes of a sort of light Wood ... so small, that they carry but one Man, whose legs and breech are always in the Water. The acquisition of the catamaran and outrigger canoe technology by the non-Austronesian peoples in Sri Lanka and southern India is due to the result of very early Austronesian colonization of the region that have since been assimilated, including the Maldives and Laccadive Islands, estimated to have occurred around 1000 to 600 BCE and onwards. This is still evident in Sri Lankan and South Indian languages. For example, Tamil paṭavu, Telugu paḍava, and Kannada paḍahu, all meaning "ship", are all derived from Proto‑Hesperonesian *padaw, "sailboat", with Austronesian cognates like Javanese perahu, Kadazan padau, Maranao padaw, Cebuano paráw, Samoan folau, Hawaiian halau, and Maori wharau. Genetic studies on Maldivians have also identified Austronesian admixture. Until the 20th century catamaran development focused primarily on sail-driven concepts. The first documented example of double-hulled craft in Europe was designed by William Petty in 1662 to sail faster, in shallower waters, in lighter wind, and with fewer crew than other vessels of the time. However, the unusual design met with skepticism and was not a commercial success. The design remained relatively unused in the West for almost 160 years until the early 19th-century, when the Englishman Mayflower F. Crisp built a two-hulled merchant ship in Rangoon, Burma. The ship was christened Original. Crisp described it as "a fast sailing fine sea boat; she traded during the monsoon between Rangoon and the Tenasserim Provinces for several years". Later that century, the American Nathanael Herreshoff constructed a double-hulled sailing boat of his own design (US Pat. No. 189,459). The craft, Amaryllis, raced at her maiden regatta on June 22, 1876, and performed exceedingly well. Her debut demonstrated the distinct performance advantages afforded to catamarans over the standard monohulls. It was as a result of this event, the Centennial Regatta of the New York Yacht Club, that catamarans were barred from regular sailing classes, and this remained the case until the 1970s. On June 6, 1882, three catamarans from the Southern Yacht Club of New Orleans raced a 15nm course on Lake Pontchartrain and the winning boat in the catamaran class, Nip and Tuck, beat the fastest sloop's time by over five minutes. In 1936 Eric de Bisschop built a Polynesian "double canoe" in Hawaii and sailed it home to a hero's welcome in France. In 1939, he published his experiences in a book, Kaimiloa, which was translated into English in 1940. Roland and Francis Prout experimented with catamarans in 1949 and converted their 1935 boat factory in Canvey Island, Essex (England), to catamaran production in 1954. 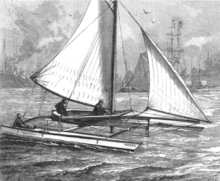 Their Shearwater catamarans easily won races against monohulls. Yellow Bird, a 1956-built Shearwater, raced successfully by Francis Prout in the 1960s, is in the collection of the National Maritime Museum Cornwall. Prout Catamarans, Ltd. designed a mast aft rig with the mast aft of midships to support an enlarged jib—more than twice the size of the design's reduced mainsail; it was produced as the Snowgoose model. The claimed advantage of this sail plan was to diminish any tendency for the bows of the vessel to dig in. 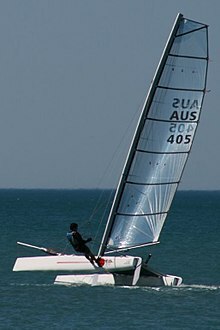 In the mid-twentieth century, beachcats became a widespread category of sailing catamarans, owing to their ease of launching and mass production. In California, a maker of surfboards, Hobie Alter, produced the 250-pound (110 kg) Hobie 14 in 1967, and two years later the larger and even more successful Hobie 16. As of 2016, the Hobie 16 was still being produced with more than 100,000 having been manufactured. The Tornado catamaran was designed by three Englishmen for a crew of two in 1967 as an Olympic catamaran candidate. At the Olympic Catamaran Trials of the International Yacht Racing Union, IYRU, it outperformed the other challengers for the role and was selected for the multihull discipline in the Olympic Games from 1976 through 2008. It was redesigned in 2000 and remains one of the fastest double-handed catamaran models. Australia became the site of builders of large transport catamarans—Incat in 1977 and Austal in 1988—each building civilian ferries and naval vessels. The largest ship ever built in terms of gross tonnage, the Pioneering Spirit, incorporates a catamaran design. A 45' catamaran under sail, showing minimal bow wave and wake, thanks to slim hull sections, light displacement and a long LWL. Catamarans have two distinct primary performance characteristics that distinguish them from displacement monohull vessels: lower resistance to passage through the water and greater stability (initial resistance to capsize). Choosing between a monohull and catamaran configuration includes considerations of carrying capacity, speed, and efficiency. At low to moderate speeds, a lightweight catamaran hull experiences resistance to passage through water that is approximately proportional to the square of its speed. A displacement monohull, by comparison, experiences resistance that is at least the cube of its speed. This means that a catamaran would require four times the power in order to double its speed, whereas a monohull would require eight times the power to double its speed, starting at a slow speed. For powered catamarans, this implies smaller power plants (although two are typically required). For sailing catamarans, low forward resistance allows the sails to derive power from attached flow, their most efficient mode—analogous to a wing—leading to the use of wingsails in racing craft. Catamarans rely primarily on form stability to resist heeling and capsize. Comparison of heeling stability of a rectangular-cross section monohull of beam, B, compared with two catamaran hulls of width B/2, separated by a distance, 2×B, determines that the catamaran has an initial resistance to heeling that is seven times that of the monohull. Compared with a monohull, a cruising catamaran sailboat has a high initial resistance to heeling and capsize—a fifty-footer requires four times the force to initiate a capsize than an equivalent monohull. Calm water transportation efficiency of a vessel is proportional to the full-load displacement and the maximum calm-water speed, divided by the corresponding power required. Large merchant vessels have a FnV between one and zero, whereas higher-performance powered catamarans may approach 2.5—denoting a higher speed per unit volume for catamarans. Each type of vessel has a corresponding calm water transportation efficiency, with large transport ships being in the range of 100–1,000, compared with 11-18 for transport catamarans—denoting a higher efficiency per unit of payload for monohulls. Gitana 13, an ocean-racing catamaran. Sailing catamarans have been noted for incorporating technological advances over traditional monohull craft. These include foils that lift racing catamarans out of the water, capacious and stable cruising vessels, and racers that have achieved average speeds on the open ocean, comparable to much larger vessels. Recreational and sport catamarans typically are designed to have a crew of two and be launched and landed from a beach. Most have a trampoline on the bridging structure, a rotating mast and full-length battens on the mainsail. Performance versions often have trapezes to allow the crew to hike out and counterbalance capsize forces during strong winds on certain points of sail. For the 33rd America's Cup, both the defender and the challenger built 90-foot (27 m) long multihulls. Société Nautique de Genève, defending with team Alinghi, sailed a catamaran. The challenger, BMW Oracle Racing, used a trimaran, replacing its soft sail rig with a towering wing sail—the largest sailing wing ever built. In the waters off Valencia, Spain in February 2010, the BMW Oracle Racing trimaran with its powerful wing sail proved to be superior. This represented a break from the traditional monohulls that had always been sailed in previous America's Cup series. On San Francisco Bay, the 2013 America's Cup was sailed in 72-foot (22 m) long AC72 catamarans (craft set by the rules for the 2013 America's Cup). Each yacht employed hydrofoils and a wing sail. The regatta was won 9-8 by Oracle Team USA against the challenger, Emirates Team New Zealand, in fifteen matches because Oracle Team USA had started the regatta with a two-point penalty. Cruising sailors must make trade-offs among volume, useful load, speed, and cost in choosing a boat. Choosing a catamaran offers increased speed at the expense of reduced load per unit of cost. Howard and Doane describe the following tradeoffs between cruising monohulls and catamarans: A long-distance, offshore cruising monohull may be as short as 30 feet (9.1 m) for a given crew complement and supporting supplies, whereas a cruising catamaran would need to be 40 feet (12 m) to achieve the same capacity. In addition to greater speed, catamarans draw less water than do monohulls—little as 3 feet (0.91 m)—and are easier to beach. Catamarans are harder to tack and take up more space in a marina. Cruising catamarans entail added expense for having two engines and two rudders. Tarjan adds that cruising catamarans boats can maintain a comfortable 300 nautical miles (350 mi; 560 km) per day passage, with the racing versions recording well over 400 nautical miles (460 mi; 740 km) per day. In addition, they do not heel more than 10-12 degrees, even at full speed on a reach. Yachting has seen the development of multihulls over 100 feet (30 m) in length. "The Race" helped precipitate this trend; it was a circumnavigation challenge which departed from Barcelona, Spain, on New Year's Eve, 2000. Because of the prize money and prestige associated with this event, four new catamarans (and two highly modified ones) over 100 feet (30 m) in length were built to compete. The largest, PlayStation, owned by Steve Fossett, was 125 feet (38 m) long and had a mast which was 147 feet (45 m) above the water. Virtually all of the new mega-cats were built of pre-preg carbon fiber for strength and the lowest possible weight. The top speeds of these boats can approach 50 knots (58 mph; 93 km/h). The Race was won by the 33.50 m (109.9 ft)-long catamaran Club Med skippered by Grant Dalton. It went round the globe in 62 days at an average speed of 18 knots (21 mph; 33 km/h). A SWATH ship has twin hulls (blue) that remain completely submerged. A catamaran configuration fills a niche for powered vessels, where speed and sea-kindliness is favored over bulk capacity. In larger vessels, this niche favors car ferries and military vessels for patrol or operation in the littoral zone. Two advances over the traditional catamaran are the small-waterplane-area twin hull (SWATH) and the wave-piercing configuration—the latter having become a widely favored design. An outgrowth of the popularity of cruising sailing catamarans are powered catamarans, which share many of the amenities found in a sail cruising catamaran. The saloon typically spans two hulls wherein are found the staterooms and engine compartments. As with sailing catamarans, this configuration minimizes boat motion in a seaway. The Swiss-registered wave-piercing catamaran, Tûranor PlanetSolar, which was launched in March 2010, is the world's largest solar powered boat. It completed a circumnavigation of the globe in 2012. The 1970s saw the introduction of catamarans as a high-speed ferries, as pioneered by Westermoen Hydrofoil in Mandal, Norway, which launched the Westamaran design in 1973. The Stena Voyager was an example of a large, fast ferry, typically traveling at a speed of 46 miles per hour (74 km/h), although it was capable of over 70 miles per hour (110 km/h). Military Sealift Command currently operates several Expeditionary Fast Transport catamarans which are owned by the U.S. Navy. These are employed for the high speed transport of military cargo and are able to get into shallow ports due to their small draft. The Makar-class is a class of two large catamaran-hull survey ships built for the Indian Navy. As of 2012, one vessel, INS Makar (J31), was in service and the second was under construction. First launched in 2004 at Shanghai, the Houbei class missile boat of the People's Liberation Army Navy (PLAN) utilizes a catamaran hull designed to accommodate the vessel's stealth features. The small-waterplane-area twin hull (SWATH) configuration reduces wave-generating resistance by moving displacement volume below the waterline, using a pair of tubular, submarine-like hulls, connected by pylons to the bridge deck with a narrow waterline cross-section. The submerged hulls are minimally affected by waves. The SWATH form was invented by Canadian Frederick G. Creed, who presented his idea in 1938 and was later awarded a British patent for it in 1946. It was first used in the 1960s and 1970s as an evolution of catamaran design for use as oceanographic research vessels or submarine rescue ships. In 1990, the US Navy commissioned the construction of a SWATH ship to test the configuration. Larger wetted surface, which causes higher skin friction drag. Significant reduction in wave-induced drag, with the configuration of struts and submerged hull structures. Lower water plane area significantly reduces pitching and heaving in a seaway. Higher sensitivity to loading, which may bring the bridge structure closer to the water. Wave-piercing catamarans employ a low-buoyancy bow on each hull that is pointed at the water line and rises aft, up to a level, to allow each hull to pierce waves, rather than ride over them. This allows higher speeds through waves than for a conventional catamaran. They are distinguished from SWATH catamarans, in that the buoyant part of the hull is not tubular. The spanning bridge deck may be configured with some of the characteristics of a normal V-hull, which allows it to penetrate the crests of waves. Wave-piercing catamaran designs have been employed for yachts, passenger ferries, and military vessels. The catamarans—sometimes called "cata-rafts"—for whitewater sports are widely spread in post-Soviet countries. They consists of two inflatable hulls connected with a lattice scaffold. The frame of the tourist catamaran can be made of both - aluminum (duralumin) pipes, and from felled tree trunks. The inflatable part has two layers - airtight balloon with inflation holes and shell made of dense tissue, protecting the balloon from mechanical damage. Advantages of such catamarans are light weight, compactness and convenience in transportation (the whole product is packed in one pack-backpack, suitable for air traffic standards), the speed of assembly (10–15 minutes for the inflation). All-inflatable models are available in North America. 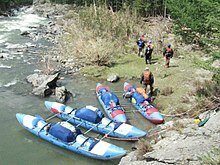 A cata-raft design has been used on the Colorado River to handle heavy whitewater, yet maintain a good speed through the water. ^ "Origin and meaning of catamaran". Online Etymology Dictionary. Retrieved 2019-03-01. ^ a b c d Mahdi, Waruno (1999). "The Dispersal of Austronesian boat forms in the Indian Ocean". In Blench, Roger; Spriggs, Matthew. Archaeology and Language III: Artefacts languages, and texts (PDF). One World Archaeology. 34. Routledge. pp. 144–179. ISBN 0415100542. ^ a b c Doran, Edwin B. (1981). Wangka: Austronesian Canoe Origins. Texas A&M University Press. ISBN 9780890961070. ^ a b c Doran, Edwin, Jr. (1974). "Outrigger Ages". The Journal of the Polynesian Society. 83 (2): 130–140. ^ Beheim, B. A.; Bell, A. V. (23 February 2011). "Inheritance, ecology and the evolution of the canoes of east Oceania". Proceedings of the Royal Society B: Biological Sciences. 278 (1721): 3089–3095. doi:10.1098/rspb.2011.0060. PMC 3158936. ^ Hornell, James (1932). "Was the Double-Outrigger Known in Polynesia and Micronesia? A Critical Study". The Journal of the Polynesian Society. 41 (2 (162)): 131–143. ^ Lück, Michael (2008). The Encyclopedia of Tourism and Recreation in Marine Environments. Wallingford, UK: CABI. p. 86. ISBN 978-1-84593-350-0. ^ "Catamaran". Dictionary.com Unabridged. Random House, inc. 2016. ^ Dampier, William (1697). A New Voyage Round the World. ISBN 1933698047. ^ Maloney, C. (1980). People of the Maldive Islands. Orient Longman Ltd, Madras. ISBN 0-86131-158-2. ^ Duckworth, Wynfrid L.H. (1914). n the Anthropometric Data collected by Professor John Stanley Gardiner, F.R.S., in the Maldive Islands and Minicoy. Cambridge Philosophical Society. ^ "Model of a twin-hulled ship - William Petty". Royal Society. Retrieved 2014-08-08. ^ "Sailing with an Achilles' keel | General". Times Higher Education. September 22, 2000. Retrieved 2014-08-08. ^ Bertie Reginald Pearn (1938). A History of Rangoon. Corporation of Rangoon. p. 136. ^ M. F. Crisp (1849). A treatise on marine architecture, elucidating the theory of the resistance of water : illustrating the form, or model best calculated to unite velocity, buoyancy, stability, strength, etc., in the same vessel : and finally, adducing the theory of the art of shipbuilding. Maulmein: American Baptist mission press. p. 94. ^ Nathanael Herreshoff (April 10, 1877). "US Patent Number 189459: Improvement in construction of sailing-vessels". ^ L. Francis Herreshoff. "The Spirit of the Times, November 24, 1877 (reprint)". Marine Publishing Co., Camden, Maine. Archived from the original on January 24, 2008. Retrieved 2014-12-02. ^ The Voyage of the Kaimiloa, London, 1940 (translated from French: Kaimiloa : D'Honolulu à Cannes par l'Australie et Le Cap, à bord d'une double pirogue polynésienne), Editions Plon, Paris, 1939 (Au delà des horizons lointains 1). ^ Bird, Vanessa (2013). Classic Classes. A&C Black. p. 65. ISBN 9781408158906. Retrieved 2016-01-27. ^ Charles E. Kanter (November 2001). "Reviewing the Prout Snowgoose 34 catamaran". Southwinds Sailing. Archived from the original on May 19, 2006. ^ Sailor's multihull guide to the best cruising catamarans & trimarans. Jeffrey, Kevin, 1954-, Jeffrey, Nan, 1949-, Kanter, Charles E., 1930- (3rd ed.). Belfast, P.E.I. : Avalon House. 2002. ISBN 0962756288. OCLC 51112242. ^ 1934-, Andrews, Jim, (1974). Catamarans for cruising. London: Hollis and Carter. ISBN 0370103394. OCLC 1273831. ^ "Hobie 16 2012 Class Report 2012" (PDF). Retrieved 2015-10-01. ^ Forbes, John; Young, Jim (2003). "A Brief Tornado History—The Story of the Tornado, the Olympic Catamaran". International Tornado Class Association. Retrieved 2016-01-27. ^ "History". Incat. 2016. Archived from the original on October 5, 2013. Retrieved January 27, 2016. ^ "Our story". Austal. 2016. Retrieved 2016-01-27. ^ "Pioneering Spirit Heavy Lift Construction Vessel". Ship Technology. Retrieved 2017-06-08. ^ a b Garrett, Ross (January 1, 1996). The Symmetry of Sailing: The Physics of Sailing for Yachtsmen. Sheridan House, Inc. p. 133. ISBN 9781574090000. ^ Yang, C.; Löhner, R.; Soto, O. (August 22, 2001). "Optimization of a wave-cancellation multihull using CFD tools". In Wu, You-Sheng; Guo-Jun Zhou; Wei-Cheng Cui. Practical Design of Ships and Other Floating Structures: Eighth International Symposium. 1. China: Elsevier. ISBN 9780080539355. ^ Weltner, Klaus (January 1987). "A comparison of explanations of the aerodynamic lifting force". American Journal of Physics. 55 (1): 52. doi:10.1119/1.14960. ^ Nielsen, Peter (May 14, 2014). "Have Wingsails Gone Mainstream?". Sail Magazine. Interlink Media. Retrieved 2015-01-24. ^ Biran, Adrian; Pulido, Ruben Lopez (2013). Ship Hydrostatics and Stability (2 ed.). Butterworth-Heinemann. p. 67. ISBN 0080982905. ^ a b Howard, Jim; Doane, Charles J. (2000). Handbook of Offshore Cruising: The Dream and Reality of Modern Ocean Cruising. Sheridan House, Inc. pp. 36–8. ISBN 1574090933. Retrieved 2016-01-27. ^ Newman, John Nicholas (1977). Marine hydrodynamics. Cambridge, Massachusetts: MIT Press. p. 28. ISBN 0-262-14026-8. .
^ a b Watson, D. G. M. (2002). Practical Ship Design. Elsevier Ocean Engineering Book Series. 1 (Revised ed.). Gulf Professional Publishing. pp. 47–48. ISBN 0080440541. See Fig. 2.1 'Slender' and 'Swath' figures. ^ Wilson, F.W. ; Vlars, P.R. (September 1981). "Operational Characteristics Comparisons". AIAA 6th Marine Systems Conference. American Institute of Aeronautics and Astronautics: 11. Retrieved 2017-03-31. ^ Eames, Michael C. (April 15, 1980). "Advances is Naval Architecture for Surface Naval Ships" (PDF). Proceedings. London: Royal Institution of Naval Architects: 31. Retrieved 2016-01-31. ^ Berman, Phil (March 1982). Catamaran Sailing: From Start to Finish. W. W. Norton & Co. Inc. ISBN 978-0393000849. ^ "BMW Oracle wins America's Cup". ESPN. Associated Press. February 14, 2010. Retrieved 2016-01-27. ^ "Ben Ainslie's USA beat Team New Zealand in decider". BBC Sport. September 26, 2013. Retrieved September 26, 2013. ^ "Oracle Team USA completes greatest comeback in America's Cup history, defeating Emirates New Zealand". New York Daily News. September 25, 2013. Retrieved September 26, 2013. ^ Tarjan, Gregor (2007). Catamarans: The Complete Guide for Cruising Sailors. McGraw Hill. ISBN 9780071596220. Retrieved 2016-01-25. ^ Zimmermann, Tim (2004). The Race: Extreme Sailing and Its Ultimate Event: Nonstop, Round-the-World, No Holds Barred. Houghton Mifflin Harcourt. ISBN 0547347065. ^ Sass, George, Jr. (October 3, 2007). "Lagoon Power 43—An exceptional first powerboat from a builder of sailing cats". Yachting. Retrieved 2016-01-25. ^ Gieffers, Hanna (May 4, 2012). "Ankunft in Monaco: Solarboot schafft Weltumrundung in 584 Tagen". Spiegel Online (in German). Retrieved May 5, 2012. ^ Bowen, David (May 4, 1996). "Forget the tunnel; all the talk on the high seas is of 50 mph (80 km/h) super ferries. And Britain doesn't make any of them". The Independent. London. Retrieved 2016-01-29. ^ "Strategic Sealift (PM3)". www.msc.navy.mil. Archived from the original on June 27, 2008. Retrieved November 1, 2015. ^ "INS Makar commissioned into the Indian Navy". Economic Times. September 21, 2012. Retrieved September 1, 2013. ^ Axe, David (August 4, 2011). "China Builds Fleet of Small Warships While U.S. Drifts". Wired.com. Retrieved 2012-02-04. ^ a b Misra, Suresh Chandra (2015). Design Principles of Ships and Marine Structures. CRC Press. ISBN 1482254476. Retrieved 2016-01-27. ^ Helfers, John (2006). The Unauthorized Dan Brown Companion. Kensington Publishing Corp. p. 271. ISBN 0806535806. Retrieved 2016-01-27. ^ Jane's high-speed marine craft (24 ed.). Jane's Information Group. 1991. ISBN 0710612664. Retrieved 2016-01-27. ^ Husick, Charles B. (2009). Chapman Piloting, Seamanship and Small Boat Handling. Sterling Publishing Company, Inc. p. 16. ISBN 9781588167446. Retrieved 2016-01-26. ^ Caprio, Dennis (July 2001). "Loomes 83". Yachting. Vol. 190 no. 1. pp. 81–84. ISSN 0043-9940. Retrieved 2016-01-26. ^ Yun, Liang; Bliault, Alan (July 8, 2014). High Performance Marine Vessels. Springer Science & Business Media. p. 206. ISBN 978-1-4614-0868-0. Retrieved 2016-01-26. ^ Brumley, Jeff (October 5, 2011). "Unusual ship visits Mayport after 6-month deployment to African waters". Florida Times-Union. Jacksonville. Retrieved 2016-01-26. ^ Fox, Peter (2016-05-26). "Cataraft Testing on the Clackamas River". Northwest Rafting Company. Retrieved 2019-03-03. ^ Steelhammer, Rick. "WV guides on US team in world whitewater rafting championship". Charleston Gazette-Mail. Retrieved 2019-03-03. ^ Lindeman, Phil (January 31, 2017). "Take 5: On the Grand Canyon 'cataraft' with the U.S. Whitewater Rafting Team". Summit Daily. Retrieved 2019-03-03.